There are many definitions of Steampunk, a fantasy style, a certain genre, even a reality. How ever you define it and how ever you feel about it. Steampunk is here to stay. Now, when it comes to those who submerge themselves in the lifestyle of Steampunk fashion, one thing is of great importance, is it true Steampunk? As arguable as that statement can be, there is a valid stand one could take on the matter. If you view Steampunk as a Sci Fi fantasy then I would think anything goes. If you hold to the belief, and the original text on the word, then your going to equate it with steam engines. As Victorian being the reflective time period, one has to take into account electricity. Yes it is confusing. In fact Steampunk is an ever changing term placed on objects made from various pieces to make a fantasy like creation. For me, the line is strongly drawn, and I love the creative mystical pieces of Steampunk I have seen. If it isn’t made with true vintage pieces, but instead, objects mass produced to look old, then it isn’t true Steampunk. Say what you will, but, an antique key is filled with history and a past only one can imagine. A mass produced brass key that looks vintage has no story to tell. 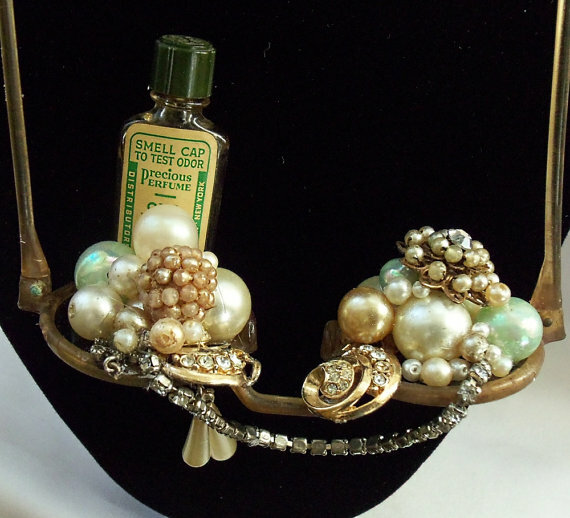 How many times I have looked at Steampunk jewelry only to see that same Octopus, pocket watch, etc…. Sure they can be arranged differently and the pieces are absolutely wonderful works of art. But, is it fare to call them Steampunk? That is where True Steampunk comes into dialect. I am by no means fully versed on all the ins and outs of this amazing art form. 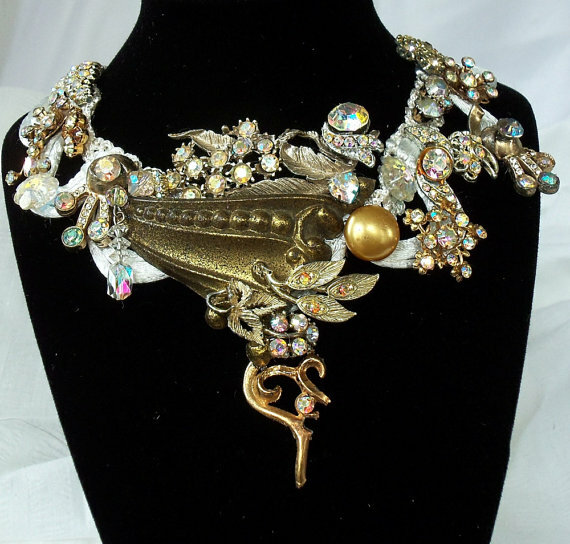 It was a surprise to find that some of my pieces were coined Steampunk. 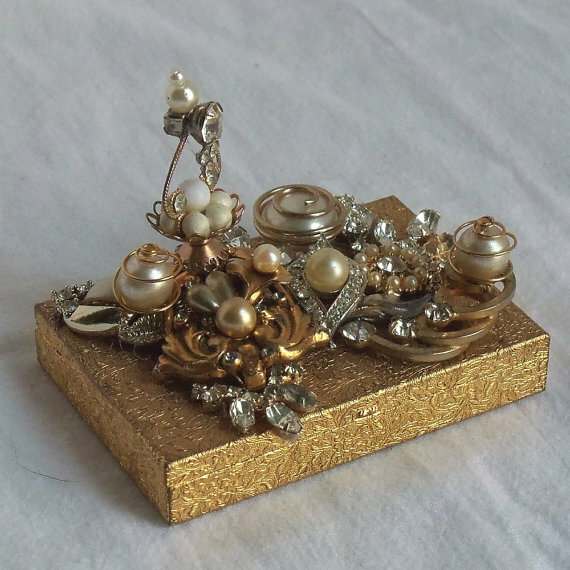 I just sought to make amazing pieces using only genuine vintage materials. I wanted to give new life to pieces that were previously loved yet somehow lost their way. Some of my pieces are quite heavy and some have succumb to their age with faded patinas. Nonetheless, they deserved to live on simply because they caught my eye. So many of us are drawn to items from the past, we feel we were born in the wrong era. 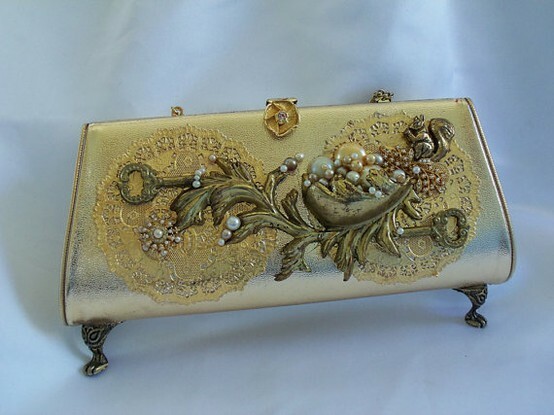 What ever the reason be…..nothing is quiet as lovely as a vintage treasure. Victorian anything is better than new everything. I will always stay true to my Steampunk pieces by using vintage castaways, misfits if you will. So the debate continues and if I ruffled some feathers with my idea of what is true and what is a clone of the past, so be it. I stand by my work and you won’t see another piece like any of the ones I create. Even I can’t reproduce any of them. Each and every one is a one of a kind, not by design but by use of vintage pieces, (however far and few they may be). Let the past keep taking me forward in my appreciation for it, and, hopefully doing it justice as it makes it way to it’s new life as a La Marelle Couture design.